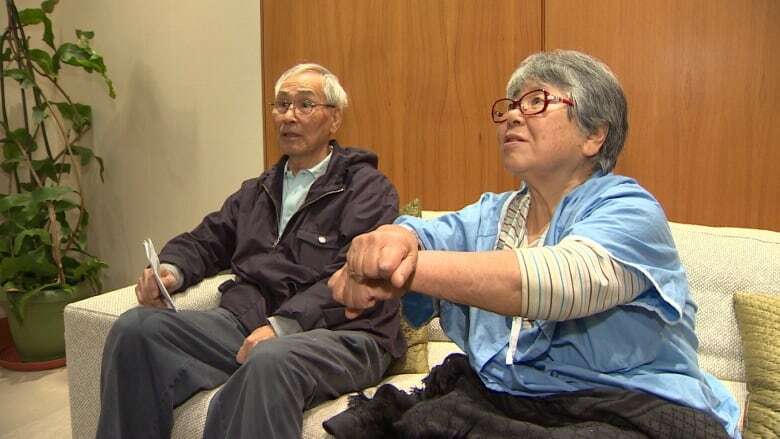 Coquitlam, B.C., police are investigating after a condo annual general meeting that had "gotten out of hand" culminated with RCMP officers dragging two senior citizens down a flight of stairs. Police were called around 10:32 p.m. and told people were fighting at the meeting held at the Best Western on North Road Thursday evening. When RCMP officers arrived, the meeting was shut down, but an elderly couple allegedly refused to leave the area. 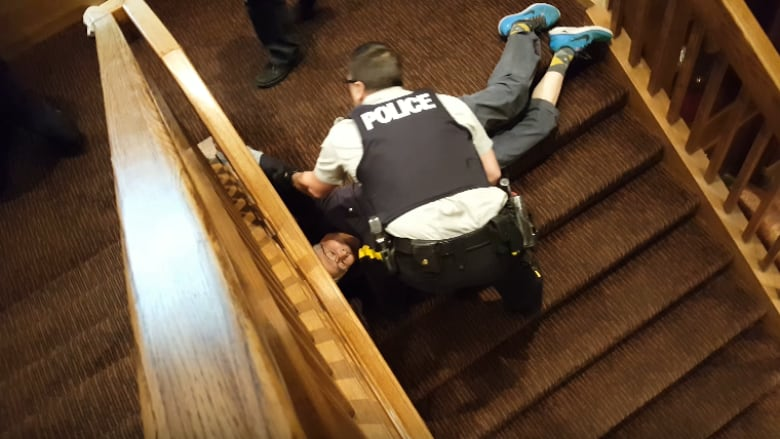 Video shows the couple appearing to resist attempts to arrest them and subsequently being dragged down a flight of stairs to the hotel's front entrance. The video also shows a young child, identified as the couple's grandchild, screaming, pleading with police and occasionally flailing at one of the officers. WARNING: This video contains disturbing images and sounds. After several minutes, the couple, Myung Ju Lee and Kap Su Lee, were taken into custody and assessed by paramedics. Supt. Sean Maloney, the officer in charge of Coquitlam RCMP, says no public complaint has been made as of yet. "However, I respect and understand that the video may cause concern to the public," he said in a statement. "As the officer in charge of Coquitlam RCMP Detachment, I have initiated a review into the actions of the police officers involved. "This review will also include looking further into the reasons behind our attendance." Police are asking the community to wait until they've had a chance to complete their review. Myung Ju Lee described in blunt terms the treatment he received from police. "He grabbed my arm, twisted it, put it behind my back, then kicked me [down the stairs] from the second floor," he said. "They pushed and kicked, and I rolled down, down, down ... Then he came down, pushed my chest using the knee. Several times. "'Are you trying to kill me? Are you trying to kill me? '", I shouted," Ju Lee continued. "And finally, at the bottom of the stairs, I was handcuffed. 'I'm not a criminal. I'm not a criminal ... I'm a senior. Why do you have me in handcuffs?'' I kept asking. They would not answer." Ju Lee had a bruise on his cheek, while his wife had scrapes along her back. Both spent the night in hospital, and say they're shocked and angry at what happened. Victor Kim, a condo owner in the strata, said he was motivated to film the incident because of how poorly he thought police were treating the couple. "They're in their eighties. Grandparents. They shouldn't have handled it that way," he said. "[It could have been solved] in a peaceful way ... I couldn't fall asleep last night."